Brought to you from the frosty shores of Norway comes a series of electric pink and black stripes: Pink Zebra. After opening the hysterically popular Mission Chinese Food, Chef Jesse Koide has undertaken a new culinary adventure. 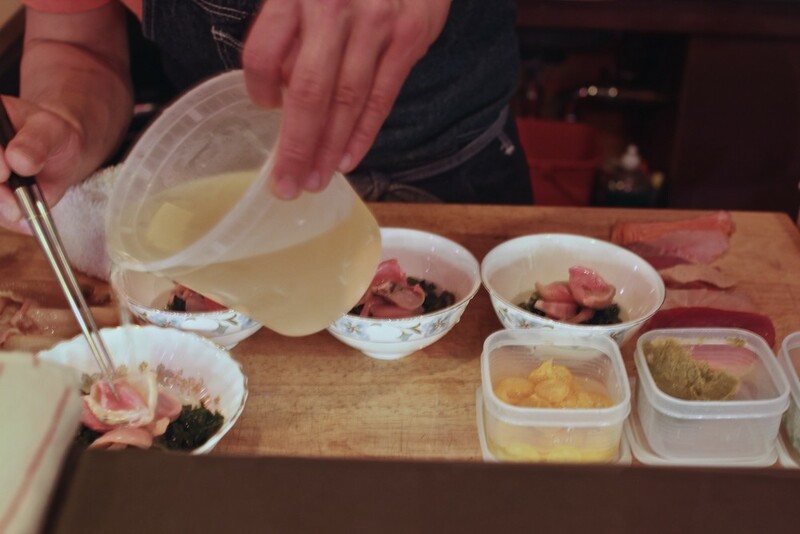 Sporting a pink zebra-print headband and a matching tattoo, Koide brings his previous experience as a sushi chef to a new table and prepares an omakase sushi dinner unlike anything else found in SF. With only five seats at the bar, the chef diligently prepares a meal from the “daily catch”, so no two menus are alike. Sitting in a dinning room adorned with pink lanterns and obscure art that could be from 1950 or 2050, the mood is set as soon as one steps into the temporary pop-up establishment on 20th Street in San Francisco’s Mission district. With vinyl playing The Smiths and the most random assortment of menu items, there is no sense in making sense of the curiously delicious food. Throughout our meal we shared a bottle of Junmai sake called Takenotsuyu or “Bambo Tears”. As is Japanese custom, we took turns pouring each other’s sake and cheering “Kampai!” throughout the course of this unreplicable meal. This fermented rice beverage, which has a similar ABV to wine, is chilled and sipped out of tiny porcelain cups. With 40% of the rice kernel milled away, this level of refinement increases the complexity of flavors, the fragrance, and the price. We commenced our sushi dinner not with sushi, but with a house-made tofu dish with cream, a miso cured grape, and fresh ground wasabi. Most commercially sold wasabi is cut with horseradish and imbued with a florescent green color, so it is a treat to enjoy this root in its unadulterated state. 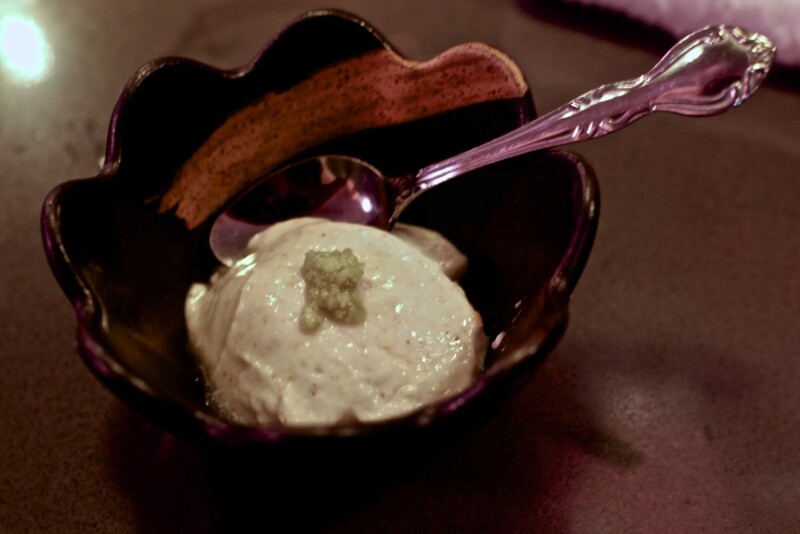 Without the intense nasally effect, the wasabi still adds a bite to the otherwise silky dish. While many people use chopsticks, sushi is traditionally a finger food so we complacently used our pincher fingers to pick up the nigiri. The sushi chef introduced us to several different types of nigiri for our meal. 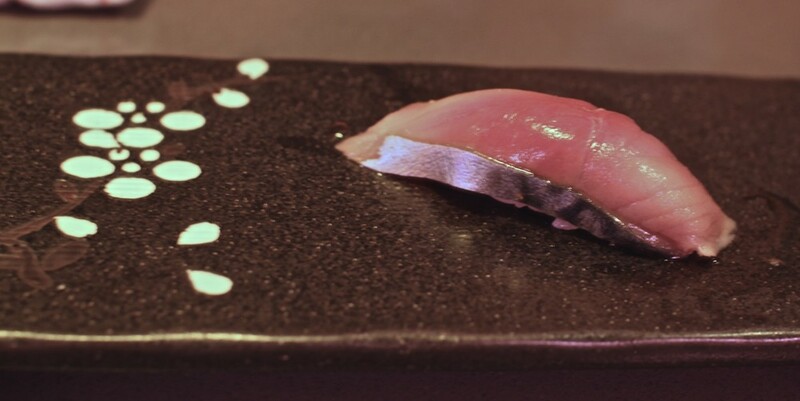 For example, we tasted a piece of tuna cut just adjacent to the bone and dipped in a sake sauce. Natural colors and patterns splashed across the different pieces of fish, yet they all had a uniform texture that melted in the mouth. We also tasted roe from a Japanese trout caught in the Columbia River, the largest river in the Pacific Northwest region. Soaked in sake and meticulously circumscribed by the highest quality seaweed from Japan, the eggs in this piece bursted with flavor. The sea urchin (uni) also had an unusual mouth feel. Salty like the ocean and creamy, this uni omitted the sandpaper texture of most commercial uni, making it some of the best uni we had ever tasted. Throughout the omakase experience we tried a few other small dishes. One Hawaiian-style poke dish had thick cubes of tuna marinated in two types of miso and three types of premium sake. Despite having such distinct tastes, the chef deserves complements for harmonizing all of these flavors. We also tried a dish with the foot (i.e. the mantle) of a butter clam, foraged by a diver in Coos Bay, Oregon. The clam foot marinated in rice vinegar and two types of sake and topped with salmon roe. The most peculiar part of this dining experience was the strong contradiction between the first half and the second half of the meal. While the first half carried a poise and precision, the second half felt like an elegant road-side diner experience in comparison. The heaviness of the second half of our meal offset the lightness experienced in the first half. Larger plates and portions dwarfed the small and mindful single tastings that we had just eaten. The most hyped dish, the hurricane popcorn, is a tangle of light popcorn with deep-fried pig ears and a homemade furikake composed of dry fish scraps (displayed on the omakase counter), seaweed, and other dried vegetables. With a squirt of lime and some butter, this savory popcorn dish blasts flavor into your mouth whether you are still politely using chopsticks or just barreling into the bowl with your hands. Pairing the popcorn with a beer, such as an Asahi Black, is essential step for this umami-packed bar snack. We also tried the five spice chicken confit with leg riette, cauliflower prepared two ways, sunchoke, and hibiscus-pickled mustard seeds. The last dish of the evening, which was by far the most rich and obscure was the menchi katsu paired with smoked tonkatsu sauce, sliced pork with Gruyère, brussels sprouts, plum pickled ginger, and citrus braised endive. The thick pork layers and melted Gruyère confirmed a feeling of satiation after this whimsical dining experience. While the location of Pink Zebra may move, it seems reasonable to believe that this pop-up is here to stay.